It would appear that prolific theatre legend Sir Alan Ayckbourn is back in fashion. Not only is the celebrated playwright premiering three new dramas at Scarborough’s Stephen Joseph Theatre this summer, but his West End hit Relatively Speaking is back on stage for the first time since its critically-acclaimed debut back in 1967. It was the initial success of Relatively Speaking that helped establish Ayckbourn as a major force within commercial theatre, and as I watched its revival at the hands of director Lindsay Posner last week, it was easy to see why. It is a masterfully constructed play that is sharply funny and acerbically astute in its depiction of the flawed relationships of the British middle classes. The drama begins in a London bedsit, which Ginny now shares with her new boyfriend, Greg. Despite being completely besotted with his new love, Greg becomes suspicious when Ginny receives a string of gifts to the house, as well as some strange and anonymous phone calls. Ginny leaves for the country for the day, telling Greg that she is going to visit her parents, when in fact she is planning to end a relationship she had with a married older man named Philip. Greg decides to follow her in order to ask “her parents” for Ginny’s hand in marriage, but when he arrives, Philip mistakes the boy for his wife’s lover, a fictional character that she has devised in order to make her husband jealous. What follows is a hilarious caper of confusion, untruth and mistaken identity that is a joy to watch as it unfolds. 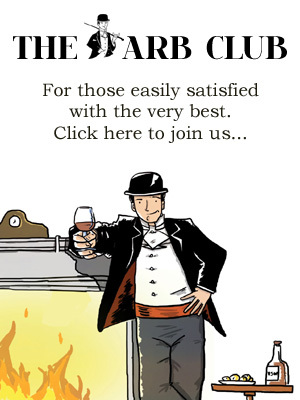 It is all so very British; Ayckbourn mocks our sense of reserve and politeness, which are the key elements that render the misunderstandings possible in the first place. It’s a giggle a minute, but Ayckbourn also has a darker message to relay about the danger of keeping up appearances. Suburban couple Sheila and Philip might have the perfect country home and a pristinely symmetrical garden, but their marriage is far from blissful. Like everyone within the play, the husband and wife address one another via a sort of code; each conversation has multiple levels of meaning. As they talk about the tea and their plans for the weekend, they struggle to maintain a veneer of polite civility which threatens to shatter at any moment to reveal Philip’s abhorrence and Sheila’s despair. Posner’s is a super slick production, and each of the four actors brings a unique tone to their performance which fits together seamlessly. Felicity Kendall is perfectly casted as the archetypal Sixties housewife, whose utter befuddlement and endearing naivety allows her to deliver some of the best lines. Max Bennett impresses both with his performance as the bumbling, love-struck Greg, and when he appears almost naked on stage. Jonathan Koy is hilarious as the chronically ungrateful husband, Philip, whose face develops beetroot hues to convey his ever-increasing sense of frustration at the situation. Only Kara Tointon disappoints with her slightly one-dimensional rendition as former wild-girl Ginny, and she renders the character mildly irritating in her brashness. The sense of humour may well be timeless, but the play is very much a product of the swinging Sixties in which it was written, and at times it feels a bit outdated. Philip is a spoiled husband who sees women in entirely misogynistic terms; either as obedient, domesticated beings or as sexual objects for his enjoyment. The barely-masked resentment that Philip has for his wife, which threatens to slip completely during a heated debate about Ginny’s married lover, makes for uncomfortable viewing at times. Similarly, Ginny belongs solely to the generation of the Sixties; as a newly sexually liberated woman, her character presents a challenge to the morals and lifestyle of the previous generation, represented by housewife Sheila. Nonetheless, Relatively Speaking remains genuinely laugh-out-loud funny, whilst Ayckbourn’s comments on our oh-so-British sense of stoic propriety remain as current as they were almost 50 years ago. As the play draws to a close, however, the laughs dry up as the audience is faced with a more sobering message about the nature of relationships. The characters might be willing to return to their former lives, but we get the distinct sensation that it is only a matter of time before the illusion of happiness starts to crumble. 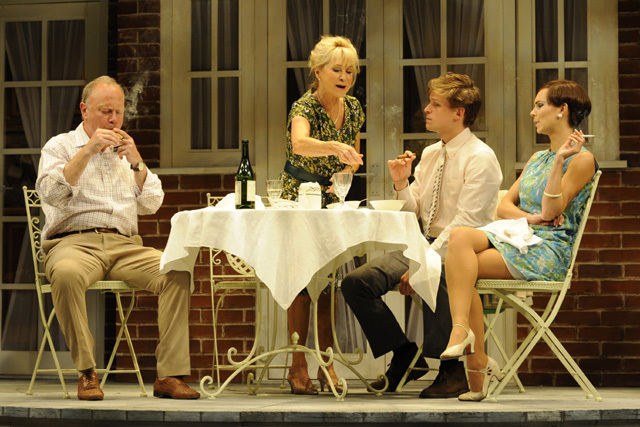 Relatively Speaking at Wyndham’s Theatre, London, runs until 31st August 2013. For more information and tickets, visit the website.